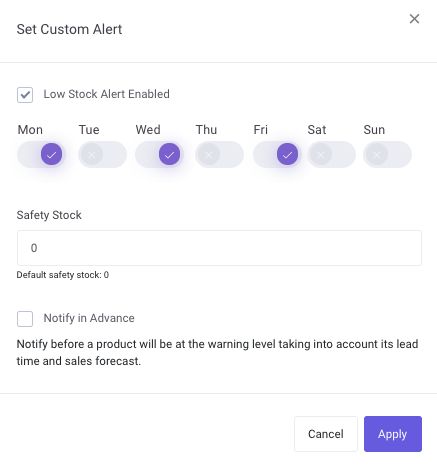 How do I set up a low inventory alert or safety stock? 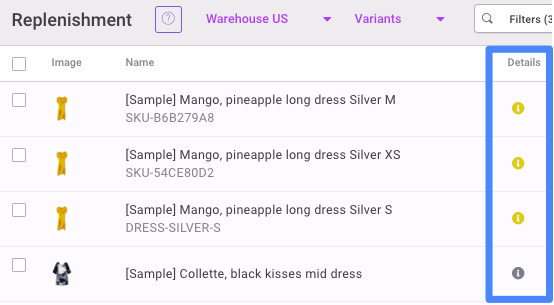 Low inventory alerts can be set for your whole store or can be customized at the SKU level. 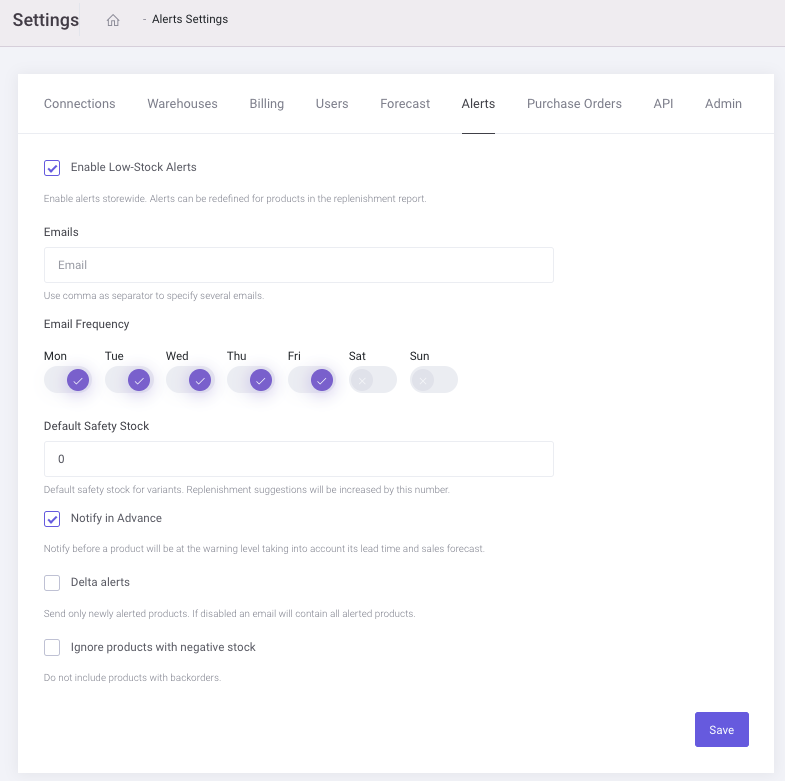 Frequency of alerts and what information you receive is also adjustable. You can enter multiple email address to ensure everyone in your company that needs to be alerted receives this information. You can set a safety stock level. Note that setting the safety stock level here will apply to all products in your store. Safety stock level can be set on the SKU level in the replenishment report. The safety stock level will be added to any replenishment recommendation. Inventory Planner recommends adding to your Days of Stock so that you have a dynamic buffer for your supply chain. Using safety stock uses a static number, meaning this will not grow as your store grows. To read more, check out our blog, The Case Against Safety Stock. 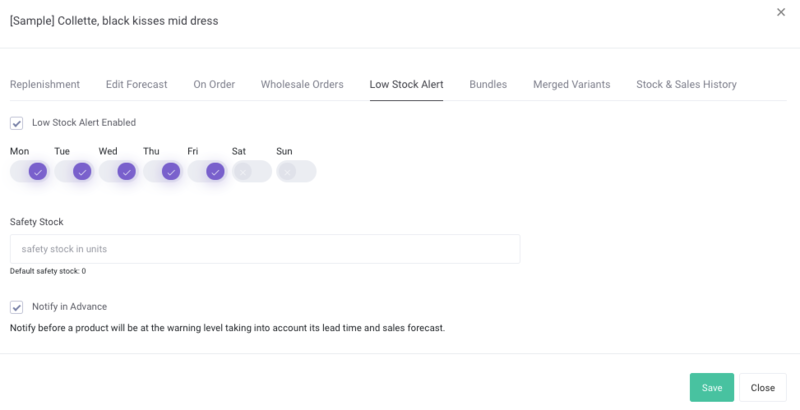 Delta alerts will send you emails when additional products trigger low stock alerts. If you'd like to set one level of alert for some but not all SKUs in your store, you can do this in bulk. This can apply to product categories, all products from one vendor or a subset of variants. 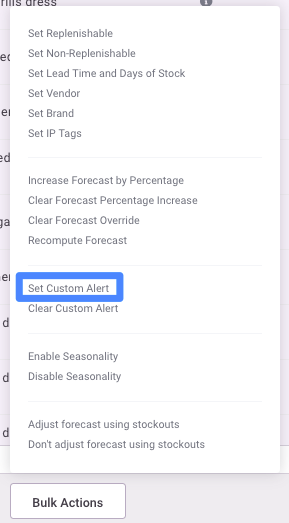 click on Bulk Actions and Set Custom Alert. Then you can set the alert frequency and safety stock. Finally, you can also set an alert for one SKU at a time. In Replenishment, click on Details. In Details, click on the Low Stock Alerts tab. Update the settings and click Save.